This expressed a sentiment with which I have never been in full accord. No way! There were many times, as a schoolchild, when I was either downright miserable or bored to utter distraction and what didn’t help things along, one little bit, was the constant fear in the playground of being run to earth and thumped by a leering moron. There were remissions, of course, and like a shaded oasis in the searing heat of the Sahara, my latter years in Oystermouth Council School are remembered as being in complete contrast to the turbulent earlier years. This was a period of relaxed happiness coupled with a sense of achievement. As for the rest of my school academic career, it had all the allure of a fly plagued, foot slog from Alamein to Tobruk. Mumbles, of old, boasted two elementary schools, Oystermouth School which was always referred to as 'the Board School' and the older school in Dunns Lane, 'the Church School'. Each school catered for approximately two hundred and fifty children, aged from four years old to fourteen. The latter school recruited from the older, west side of Mumbles and the Board School, more or less, from the rest of the surrounding area. Surprisingly, there was little contact, social or otherwise between the two institutions. When barely out of my infancy, my parents had a brief flirtation with private education and sent me to a small kindergarten in Overland Road, Mumbles, known as 'the Mount'. It was run by a formidable lady aptly named Miss Bullock. Sadly, our relationship deteriorated over a period of time (one week) and my matadorial presence was looked upon as being a disruptive one, upsetting the entire establishment. To people who knew me well, this came as a great surprise. Normally it only took twenty four hours for my true repellent nature to surface and a week of tolerance was something worthy of a place in The Guinness Book of Records. My parents were told to remove me, at once, and the school fees were eagerly refunded. I suspect that if my father had played his cards more cleverly, Miss Bullock would have gladly reimbursed him twice the amount to achieve her ends. Twenty odd years on and my brother, Colin, was attending a social function in the Langland Bay Hotel and whilst circulating, heard my name mentioned amongst a small group of people. Colin noticed the immediate effect that the sound of my name had upon a tall, bulky lady in the midst of that company. She visibly blanched, swayed, spilled her drink and began to tremble. Care was at hand, she was physically supported and seated. A large brandy was handed to her with the words, "Sip this, Miss Bullock!" Anyway, after this daunting setback to social advancement, my chastened parents decided to fling me into the deep end of the State system, which turned out to be the finest thing they could have done and, as a result, I became a pupil in the Board School, Newton Road, Mumbles. In actual fact, it took less than a day. Although an obnoxious little brat, I was no hero and one look at Miss Oriel’s clamped mouth and unblinking eyes, spelt out a clear message to me, “You don’t monkey around with a beauty like this.” I was taken away, scowling, and placed in a classroom with forty other kids. My academic career had been launched. ‘They don't build ‘em like that any more'. 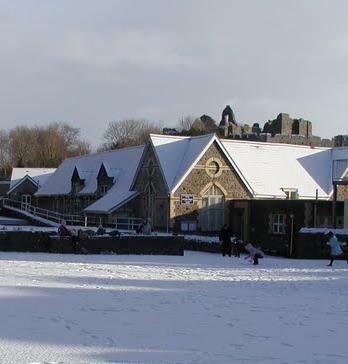 The school is well sited, free standing in a spacious area, slap bang in the heart of its catchment zone and majestically overlooked by the magnificent Oystermouth Castle. It is a monument to the excellence of the architects, planners and craftsmen of that time and, in comparison, most modern schools are made to look like a Bernhard Matthews turkey farm. For all that, a school is as good as its teachers and the Board School has been fortunate in that the excellence of the buildings has always been matched by the quality of the academic staff. Putting all this together has been a recipe for ongoing success over the years, resulting in a teaching institution of a standard with few equals in the Principality. In earlier days, the teaching staff lived in, or about, the village and as a result were fully au fait with local social conditions. Their names were household words and they basked in the prestige of a high social status. They could do no wrong! These were days of constancy and there were very few staff changes which gave one the feeling that our teachers were permanent fixtures, as permanent as the Lighthouse or the Castle, never ageing, never changing! Just always there! Headmaster, Arthur Ivor Davies was an intense, fine looking man exuding authority and I am convinced that he possessed only one suit, a well-cut gabardine three piece, of indefinable colour - a sort of grey with the slightest hint of fawn. Walking the village, he sported a grey Homburg hat, readily doffed to all and sundry. An immaculate man, he was well-groomed from his brushed grey hair down to the highly polished ankle boots, all set off by a ribboned gold pince-nez dancing on his waistcoat. He stood about five and a half foot tall, yet gave the impression of topping nine foot, a gift I am told, shared with Napoleon and Alan Ladd. He was a very capable, fair disciplinarian and ran a tight efficient ship, apparently on top of things all the time. As a little boy I was terrified of him and during my progress through the school, I kept well out of his way but grew to like him, at a distance. This then was the man at the helm, a devout Christian, proud of his school and dedicated to the well being of his pupils. Over the years, Oystermouth School has enjoyed immense good fortune in the calibre of its Head Teachers and its present incumbent, Eifion Wynne, is no exception to that rule. I must mention, en passant, past Headmaster, Alan Williams, a Mumbles lad of great ability and charm, whose calligraphic skills I would kill for! Like his late father, Albert, he was an excellent head master of this school. I left the Board School in 1937 and years later in 1944, early morning, I got off the Mumbles Train at Oystermouth Station and was crossing the Square. I was in uniform having travelled overnight and was home for seven days leave. Although bleary eyed, I was attracted by the antics of an agitated figure standing outside Forte's Ice Cream Parlour, frantically waving a rolled umbrella in the air. I realised that it was directed at me, signalling me to come to him at once! It was Arthur Ivor Davies! He greeted me warmly by name and, automatically, I still addressed him as,”Sir!” I was so flattered and it warmed my heart that he had remembered me by name and I discovered later that there were very few of his old pupils that he failed to recognise, and welcome home, this way. Standing near him, it came as a surprise to see that I now dwarfed him in stature and yet, I was still overawed by his presence! He seemed completely unchanged and, yes! he was wearing a gabardine suit of indefinable colour- a sort of mid-grey with a hint of fawn, all topped with a grey homburg hat. It would take more than a mere world war to diminish his sartorial splendour in any way. To return to Miss Oriel. As Head of the Infants, she held that prime responsibility of introducing the tiny children of Mumbles to the awesome world of 'School'. Anxious Mums would deliver their bewildered bairns to the school entrance with reactions varying from a cheerful farewell to a last sobbing, kicking embrace. Assisted by her staff (Misses Cox, Hodges, Sanders and Jones), Miss Oriel used every trick in the book (and a few more), to help her young charges settle in- —cajolery, threats, promises, and outright lies- anything !- to achieve her aim. The ends justified the means and during the passage of the following three years, her young charges were groomed and made ready for the 'Big' School. Looking back to that first day in the infants, what sticks in my mind is the smell of the school. There was the sharp odour of the ink, the dry chalky smell of blackboards, the ”papery” dryness of books, all blending into an unforgettable atmosphere, only found in a school. Added on wet days was the rubbery smell of wellies and wet clothes and, sadly, especially on hot summer days, we children added our own special something because homes, then, were lacking many of the facilities taken for granted today. This did not deter the teachers in any way, they lived in the area and they knew the score. Due to the fiasco in the Mount School, I started two weeks after the others but soon settled in. I had already learned that the closer a kid had his hair cut to the scalp, the greater was the likelihood that he was a thug and these, at first, I avoided, but after a few weeks blended imperceptibly in their midst. (this punishment was practiced throughout the school and for some reason was supposed to render a child speechless and obedient). She was discipline incarnate and once, infamously, taped up Terry Ball's mouth to stop his incessant chatter. It worked! Terry’s Mum and Dad marvelled- why hadn’t they hit upon this simple solution themselves? The general curriculum was varied as much as possible and between parroting tables and the alphabet, such subjects as drawing and painting, writing, and reading were interposed. Mid morning saw a fresh milk distribution followed by a short break for play in the yard. Regularly on fine days, classes would be taken out into the yard to play organised games—good for letting off steam and learning sportsmanship (essential, because there was a Stanley Baglow (shaven head) in every class who was inclined to brain an opponent with his rounders bat, if pitched out). By the time the age of six/seven had been reached, we had acquired a good all round basic knowledge and a jolly good idea of what was right and what was wrong. My life in the Infants’ School came to a close and I remember the hot July afternoon when the top class was assembled in the infants hall for the last time. We all looked up anxiously to Miss Oriel expecting the usual tirade but, in surprisingly subdued tones, she addressed us. Suddenly, I felt sad to be leaving her, and the other teachers. I began to feel a bit scared. After four years, I had got them all sussed out- now I had to start from scratch again. There were other things, too. “Gosh! the 'Big' School! Men teachers! Bullies in the yard! and what was that strange thing—“the Scholarship”? Immense hurdles lie ahead and filled with self-doubt, (that ‘black dog’ across my shoulders), I wondered if I had the qualities to surmount them. Immediately, I shut my mind to the distant future and thought of the holiday before me, with weeks of endless joy to share with my pals in a Mumbles Summer. A swim off the bowling green steps was a fair old start! Miss Webb, Miss Lang, Miss Leyshon. August came, and went, and on a fresh morning in early September, quaking with dread, I walked down the ramp from Newton Road into the schoolyard, wearing my new school clothes: coarse long sleeved woollen jumper buttoned up to the neck, short grey flannel trousers, stockings and studded boots. Hung about the big yard. Shrill whistle. Freeze. Shrill whistle. Line up. March in. Headmaster, Mr. Davies, addressed us briefly and handed us over to the tight hair-bunned, bespectacled Miss Webb who was to be our main teacher for the year. She took us into her classroom and we were allocated places—two to a desk, no sexual segregation. School hours in the Big School were 9.30am to 12.30pm and 2.00pm to 4.30pm, with a short play break in the middle of each session. Miss Webb taught through most of the day and to her credit, she gentled us into the new routine. She appointed ink monitors and book monitors, these posts were circulated as a reward and were much coveted, as were the little brass badges that denoted rank. Again, tables were parroted and, laboriously, we learned to write with “dip” pens. We read to ourselves and we read out loud. We were smacked for talking, we were smacked for “not trying”, we were smacked for not sitting upright with folded arms and in spite of ourselves, we learned. Over the next two years we passed through the hands of, the lavender and black clad, Miss Lang (who was ten foot tall) and the gingery, plump and waspish Miss Leyshon who, with perseverance, rapier tongue and unspared rod, rendered us fit to be handed over to Mr. Ramond Bradshaw of Standard 4, - for the Scholarship countdown! The pussyfooting was over! From now on it was for real. During those first two years in the big school, we had become 'yard-wise', knowing how to avoid the barbarians. Our vocabulary, too, was enlarged by “naughty” words, learned from our seniors, but were rarely used. To hear profane language in the school yard was unusual amongst our age group, possibly because it was a reflection upon Mumbles society in general. As we grew in physical stature, so we were troubled less and less by the potential assassins in our midst, yet were never able to move about without constant vigilance. Perhaps all this was a good preparation for life outside in the adult world. I have it from good authority that James Bond received his basic training in our Board School yard. September 1934, aged 9, I moved up to Mr. Bradshaw's class. Along with my contemporaries, I could now read with ease, write well, gabble off all my tables, turn out a reasonable composition and multiply and divide. 'Braddy' was a delightful person and soon put to flight any fears of having a 'man' teacher. He was not above slapping a head or two, or dusting a boy's trousers with a cane, but he was fair and listened before acting. I much admired him as a man, as well as a teacher, knowing that he had served as a soldier in the trenches during WW1. Braddy also doubled up as the sports master and somehow during his working week, found time to inflate and lace footballs or resuscitate cricket gear. All equipment was precious and it was to his credit that no game was ever cancelled through lack of these items. He was a sincere, enthusiastic teacher with an eye for potential and, to this day, is remembered with great affection by old pupils (those few who are still with us). We soon came to know all about the mysterious “Scholarship” and what it meant. This exam, if passed, meant that at the age of 11 or 12, the pupil would transfer to the Grammar School system with the unlimited scope that that meant. So, Braddy started us off on the three year path to that fateful examination. Long division, LCMs, HCFs, £.s.d., mathematical problems, rods, poles and perches (you name it), were hammered into us. Penmanship ensured a good hand. Geography and history taught us, that there was life beyond Blackpill. Monotony was avoided with arts and crafts sessions and lessons on bodily functions through which we sniggered as only little boys can snigger. When possible, PT exercises were held in the yard and we giggled as we saw the girls running around with their blouses tucked into their voluminous navy blue bloomers. Welsh lessons were haphazard and few. Other talents, as they emerged were nurtured and, even at the tender age of nine, it was easy to see that Glen Road’s Gwyn Evans had soccer skills. Tall and rangy, Gwyn could run like a hare and, under Braddy's tutelage, developed into one of the finest soccer players to come out of Mumbles. He was a (before an incredible, capacity crowd of 30,000 plus!). Gwyn played a blinder and professional success followed for many seasons in the Football League. Also in our form, Peter Elias began to emerge as a force in the local game, eventually becoming a linesman and referee at top levels. Like Gwyn, Peter was a great gentleman on and off the park, and became a lifelong friend. Academically, too, stars began to glimmer especially amongst the girls. Mary Copp, Pamela Summers, June Sturton, Betty Rosser and Pat Fenwick always seemed to have the answers and lagging, not far behind, was Tom Teague, Ivor Jones, Frank Gold, Leslie Cummings and George Stell. This select group stayed in the vanguard throughout, setting terrifying standards. Braddy's year flew and, in no time, September 1935 came round with the prospect of facing Mr. Gibbs, in Form V.
Again, the ‘black dog’ was on my back. Would I measure up? By the end of the academic year in Standard 4, assessments had been made on individual pupils. If they were of “scholarship material”, they would continue in this stream and move up to Mr. Gibbs’ class and, in fairness, most of the class at this stage, were deemed worthy of higher education. Those few who were not, were ‘moved sideways’ to 'Dappy' Rowlands’ class, Vb. What this literally meant was that some children, at the tender age of nine, would forfeit any chance of a higher education and would eventually leave Oystermouth School, at the age of 14 with only a basic, but well taught, three ‘Rs’. Dappy Rowlands, by any standards, was a character. He was a small, well groomed man, and sported a pencil moustache ‘a la Douglas Fairbanks’. When he spoke, he emphasized his words with the exaggerated wrist movements of a Jack Benny. He was a gentle man, but, woe betide anyone who aroused his ire, he could slap a head with the best of them. He seemed to be a misfit in this school, being bilingual and having a degree, (unusual at this level of teaching in those days) and, in addition, was a talented pianist. When his class combined with Mr. Gibbs' for music, he would accompany (or rather, perform)- every movement being over emphasized! He was, indeed, an enigma. Although the class was still co-educational, the songs we now sang were real men's stuff! No more of that ‘Madam will you walk’, “Where e’er you walk..” rubbish, but red blooded stuff like 'The Bonnets of Bonny Dundee', ‘Fairwell Manchester!’ and ‘Here's a Health unto His Majesty!’ These were songs of substance and how we belted them all out! To this day, I've never heard “…a Health unto his Majesty…” sung better than by John Rees (the butcher's son) who had a fine strong rich soprano voice. He boasted that the quality of his voice was due entirely to the content of his father's superb sausages. “But I didn’t do anything, Sir! Any further objections would be rewarded with a resounding smack across the back of the head. End of protest. To digress a moment. These were the days when children always went home for ‘dinner’. There was no school canteen, no subsidised lunches. This meant that four times a day, the streets of the village would be thronged with children in transit between school and home. These were safe days and there was no need to be escorted by parents. Children emptied out of the school en masse and made their presence felt throughout the village with their laughter and cries as they made their ways home. Rather a nice noise! Sadly, long gone ! In the morning, there never seemed to be any spare time and, to be late was big trouble, accordingly, one didn’t hang about! The dinner break of an hour and a half, however, afforded ample time for not only eating a meal, but a leisurely return, with time to play en route. Depending on the time of the year, we played conkers, 'arlies', whip and top and found time to stop at Steve Davies’s shop or, best of all, Mr. George's sweet shop, to buy two ounces of sweets (one penny). Eating these sweets in school time was absolutely taboo and transgressors met sudden and awful retribution; apart from confiscation, a good whacking was administered. Mr. Gibbs, however, being a comedian, went further. Sometimes as a change from toasted torpedoes, Sharps' toffees or tiger nuts, we would choose a lollipop from Mr. George’s incredible selection. These were of a substantial size and incredible value for a penny. What was not consumed in the lunch break would be wrapped up in an indescribably filthy handkerchief and put in pocket. Half way through the afternoon, being the addicts we were, some yielded to temptation and behind a book, the unclothed lollipop,(now covered with little greeny-brown flakey things from the handkerchief), would be inserted into mouth. Mr. Gibbs was no idiot, he knew that no one, normally, read a book held up horizontally before the face so, creeping up behind the unsuspecting lad, he would pounce and grab him by the collar. Two stingers were delivered on each hand, he would then take the lollipop and wipe the sucked end all over the lad's face, around the back of his neck, his ears and finally shove it between his collar and the back of his neck, and leave it there. The sticky culprit had to remain like that until the end of the afternoon. It cured many an addict (for a while). Sometimes I would fantasise about revenge on Mr. Gibbs with a sticky lolly. I wouldn’t stick it down his collar. By ten years of age, talents were developing amongst a number of pupils, especially in music. One gifted lad was Cameron (Cammie) Rosser who, although beset with problems regarding his class work, was demonstrating skill as a pianist, far beyond his years. Cammie became the star of all the school concerts during his Board School days—especially, the Silver Jubilee of King George V in 1935 and the Coronation of King George VI in 1937. Cameron was fortunate in establishing himself in a musical career and eventually finished up as manager of Duck, Son and Pinker’s the prestigious pianoforte retailers in Union Street, Swansea. Our other rising star was Frank Gold who had an angelic face and a voice to match, he, too, pursued a career in music, not only to sing professionally but to become a music journalist. In 1935, the humdrum routine of school life was interrupted by the celebration of George V’s Silver Jubilee. There was a national holiday on the day itself, and the event was celebrated with tremendous enthusiasm throughout the whole of Britain. Every backstreet was festooned with flags, trestle tables groaned with good things and the nation partied. Immense coverage was given to the Jubilee procession by the press and the cinema came into its own through the medium of the new Technicolour film. How stirred we all were at the sight of the Empire Forces, marching past in full dress uniform, seen for the first time in glorious colour! By today's standards the coverage would be judged as primitive, but to open mouthed innocents of my generation, it was awesome! —we were so proud to be British! A lasting memory is the camera close-up of King George V, a dignified bearded figure in Field Marshall's uniform, mounted on a magnificent black horse. He looked every inch a monarch, yet seemed so weary, not having recovered fully from a recent pneumonia. He was to pay dearly for that parade within a year. ….that’s show business for you…..
Cammie Rosser helped save the day by playing something very difficult on the piano, we didn’t know what the hell it was, but we clapped madly. Frank Gold, sang “…Cherry Ripe, Cherry Ripe..…” with such rippling of his tongue, that Walter Meyrick was heard to whisper, “…that would shake the cherries off a tree…”. Enviously, we talentless morons cheered them off the stage. Finally, with a few dramatic chords on the piano, Dappy Rowlands brought us to our feet to belt out the two National Anthems. None of us knew the Welsh one after the first line, but we moved our lips and then made up for it with a double fortissimo “God Save the Queen”. After the celebrations, by courtesy of the Swansea Borough Council, every child was presented with a handsome souvenir flat tin box, containing a large bar of milk chocolate. This lovely box was made of Swansea tinplate and beautifully painted. What priceless collector’s pieces these eventually became! Meanwhile, in Europe dreadful things were happening, of which we were not unaware. Like our elders, we never dreamt that the posturings and struttings of Hitler, and Mussolini could possibly constitute a serious threat to our impregnable Empire and as for those funny little Japanese soldiers- weeel, I ask you?!! By any stretch of the imagination we could not have foreseen that within four years we would be at war with Germany and that many of our boys in the top class, like Norman Colley, Percy Thomas, John Sidney, and others, would be fighting for their country. Quickly, normal school routine was re-established and my contemporaries and I began to feel the pressure of increasing academic work. So many complex tables and formulae! With relief, I was, at long last losing my fear of fractions and taking on board new challenges as my sojourn in Mr. Gibbs’ class came to an end. After the usual fantastic summer holiday, mostly spent in Langland, I returned full of autumn dread for the annual move-up. This time it was to Mr. Evan Davies’ class, Standard 6- the Scholarship Class and once again there was a complicated final seeding with others, less fortunate, being moved ‘sideways’ into 'Dolly” Robinson's class to join those elevated from Dappy Rowland’s class. I rarely came into contact with Dolly but remember her as being the nearest we came, in Oystermouth School, to having a girls’ sports mistress, a sort of counterpart to Braddy. Dolly walked with a pronounced spring in her step. As her weight descended on to a foot, so her toes would flex and lift her entire body vertically a couple of inches, thus creating a walk that moved in two dimensions, vertical and horizontal, rather like a plastic duck on a choppy stream. With her hair cut very short above the back of the neck, head held high and this pogo stick walk, she radiated an aggressive physical energy. She was a handsome woman, with a dominant personality and voice to match. Looking back, I’m surprised that she had managed to avoid being ensnared in a marriage because I thought she would have had a great appeal to bearded males in sandals who like to scale mountains in blizzards, sort of thing. In harmony with mysterious hormonal changes within our skinny frames, outward appearances were subtly changing. Pimples. Fuzz. Longer faces and things. Awareness of appearance. We still wore short trousers regardless of weather, but shirts and ties were gradually replacing the coarse woollen jerseys. In summer, standard dress was a tieless shirt with the collar over the neck of the jacket. Shoes (or white daps in the summer) replaced boots and hair was longer, parted with the help of cheap brilliantine (sixpence a gallon), from Ted Priddy's or from demon barber, Sammy Harris ('Sammiearris’). ‘Brylcreem’, the new exotic hairdressing, that was storming the market, was way out of our price range. Even more so, the girls were smartening up and the simple, single clip-in-hair styles were being replaced by more elaborate styling. Clothes became smarter and skirts and blouses replaced the simple cotton frocks. Along with all this came the inevitable coquettish behaviour of the female species, eye lashes fluttered and there was a marked increase in little love notes crossing the classroom. Verbally, too they had a lot more to say for themselves. I suspect that they, too, were the victims of strange hormonal activity. Girls were funny creatures. So, in 1936, we reached Evan Davies’ class looking a little smarter and aware that we had survived being eliminated from the top stream. Evan Davies had the reputation of being the ‘hard’ man and to him fell the specific task of extracting every ounce of effort from his charges in order to amass knowledge for ‘the day’. He was determined to drive everyone to the limit of their ability and didn’t spare the rod in doing so. He was a tall distinguished looking man with thick grey hair and a heavily lined face which gave him a severe countenance, not a true reflection of his nature. He was gifted in many ways being a superb blackboard artist, able to illustrate his teaching with exquisite drawings; these he executed whilst chewing simultaneously on his tongue between his back teet (fascinating to watch!). He was a talented musician, an exquisite raconteur and a devout Christian, firmly believing that it was his duty to instil a good way of life into his charges. One adage he taught which I shall never forget, it was whacked (literally) into all of us. ‘When Wealth is lost, Nothing is lost. Sadly, some remember Evan only as a disciplinarian 'of the old school'. True, he was heavy handed and there were few of us who did not feel the burning sting of his cane, but he never humiliated a child with a tongue-lashing-- the worst punishment of all, and far harder to forgive and forget than a good old fashioned belt around the earhole. Hardened malefactors swore that he was responsible for more scar tissue than the entire surgical staff of the Swansea General Hospital. Maybe so! but, my goodness, he could teach! In any case, the cane and the blistering thwack across the head was an accepted way of school life to my generation and (after recovery from concussion) few seemed to bear any grudges. There was another side to Evan: when pleased with a pupil’s efforts, the veil of severity would readily drop and a smile transform his face completely. We were privileged to have known Evan Davies and I remember him, with gratitude and affection, certainly one of the great teachers of his time. So, in 1936, Evan Davies pushed us hard up the home straight for the Scholarship examinations! If one passed, it was on to one of the Grammar Schools. Meanwhile history was still being made in the world outside and all too soon after the celebration of his Silver Jubilee, our king paid for his folly in the procession. At a quarter to midnight on Monday 20th January 1936, King George V, died in his sleep and was succeeded by his eldest son, Edward, Prince of Wales. The country fell into deep mourning and once again, our local cinema was the medium which brought to us the immense solemnity of the occasion. She was the American divorcee who had captured Edward’s heart. The poor chap was completely besotted and his behaviour brought about a constitutional crisis and an impasse. Inevitably, it led to his Abdication. Mrs. Simpson’s pinched our king”. At eight minutes to two on Friday 11th December 1936, George Albert, Duke of York, became King George VI, Emperor of India. It is probable that no British monarch ascended the throne with a greater apprehension and reluctance. He sent his brother packing with a new label,- HRH the Duke of Windsor, and, not knowing of the ex-King’s amassed personal fortune, a tax-free £25K a year. (Not bad when compared to a miner’s £150.0s.0d. a year). Unwittingly, history had been made and I had been the passive subject of three kings, in one calendar year! The Coronation in May 1937 of King George VI and Queen Elizabeth was a celebration far surpassing that of the Silver Jubilee, magnificent though that was. Again, public buildings, streets and schools were festooned with red, white and blue flags and bunting and, as before, Oystermouth School held its own celebration before the actual day. Once again, after the school concert every child was sent home with a handsome tin containing a slab of Cadbury’s milk chocolate. This time the concert was a far better production than that held for the Jubilee. In addition to semi-pro performers, Frank (Cherry Ripe) Gold and Cammie (Moonlight Sonata) Rosser, other quality performers were unearthed from a series of auditions. Sadly, one omission, was deeply resented by Standard 7, that of our own Standard 7’s John Parfitt. His performance fell at the first audition hurdle. Perhaps John was ahead of his time and the judges were not ready for such an audacious talent. “…When I’m cleaning windows..”, accompanied by spellbinding impersonations of a ukulele. Audition judges, Mr. Gibbs and Miss Fanny Owen looked positively shaken during, and after, hearing, John’s absolutely awful voice and the risqué content of the lyrics. His ghastly impersonation of a ukulele accompanied by strumming actions on an imaginary instrument likened him to an epileptic dervish. He was turned down flat. As John retired to the back row of the classroom he fired a Parthian shot, “B…. amateurs. Don’t know a brilliant artiste from a cow’s backside”. (In spite of this setback and what seemed irreparable damage to his self esteem, John rallied. Within five years he was at sea with the Royal Navy to see action in the Far East against the Japanese Navy. After the war, he returned to Mumbles and had the good sense to marry into one of Mumbles oldest and finest families- he married one of the lovely Peachey girls. He maintained his RN connection by enlisting in the RN Cadets, eventually attaining the exalted rank of Lieutenant Commander. Not only that, but he served many years as a Mumbles lifeboatman). Show biz’s loss was the Senior Service’s gain, - mind you, - John never got over the illusion that he could sing and he never forgave Mr. Gibbs and Fanny Owen. In spite of Coronation activity, school academic life had to continue. The first part of the Scholarship examination (“the Preliminary”) was sat in our own school hall. Amongst those successful were, George Stell, Bernhard Hullin, Richard Davies, Leighton Warmington Jones and, by a miracle,- me. A little later in the year, we sat the gruelling final part of the exam in Dynevor School, Swansea. On the day, prior to going into the school for the examination, we waited in the school yard and I was staggered to see that so many boys had come to sit this examination. There was at least a half a million milling lads, from all parts of Swansea, competing for one of the 90 places available in the Grammar school system. Being a bookies grandson, I worked out the odds on success- 500/1 against. We waited until a gowned gentleman bustled importantly into our midst and shepherded us to appropriate classrooms. Another gowned and mortar boarded, gentleman distributed the exam papers, face down on the desks. At 0915 hrs, on the dot, he gave the go ahead to start. First paper was a fifteen minute paper in mental arithmetic. This was followed by a one hour paper of full arithmetic. Then a ten minute break was allowed out in the yard, to unwind. An unpleasant discovery was the enormous amount of really bad language being voiced by some lads from other schools! Undeterred, back to the classroom. Two English papers and then, it was all over! For better or for worse, the dreaded scholarship examination was behind us. So! 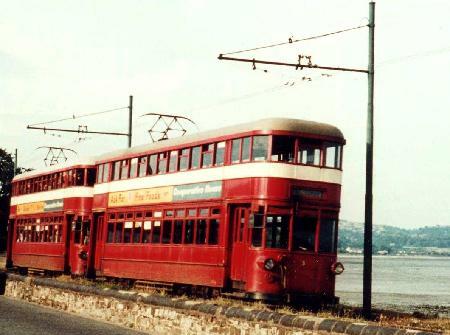 Let’s get back to Mumbles! As pre arranged, the Mumbles lads met outside the Albert Hall, hopped on a 77 ‘bus to the Slip and caught the train back home - to sanctuary! En route, answers were compared and the papers discussed. Suddenly, I was feeling weary and very, very hungry. Evan Davies had done his bit! He had seen us through the Scholarship year and his job, as far as we were concerned, was completed. We moved up to Standard 7 to await our respective fates and the vacated places in Evan’s class were refilled instantly by the following year’s Scholarship pupils. Poor devils! Standard 7. Mr Gibbs again. The last lap. In the meantime, Mr. Gibbs, who had taught us in Standard 5, had been promoted to Deputy Headmaster and had taken over Standard 7. Once again I was in his hands but this was a rather different Mr. Gibbs to the one I remembered at the lower level. The older (and bigger) boys had found his comic antics unamusing and he found himself with no alternative other than to change his approach and attitude. It was for the better! I now found him to be a far easier person to get on with and he was stimulated to demonstrate a more inventive side to his personality. This was a reserve upon which he had to draw, deeply, having forty lads in his care whose sole purpose was to move on and leave school. He had the immensely difficult task of trying to keep them constructively occupied for their remaining time under his tutelage..
For this last lap, the powers that be had brought segregation of the sexes. After all, we were now 12 to 14 years of age. A dangerous age, when our hormones were jangling and we suddenly noticed that girls had a different shape. Who knows what awful things may happen if boys and girls of this age were kept in close proximity in the same room? So, the girls were shielded from our fermenting evil thoughts and coralled under the control of the hawkeyed Fanny Owen. Not all the girls were happy about this. There are always comedians in our midst and Standard 7 had more than its fair share. Amongst them were Percy Thomas, of John Street (whose nickname is unprintable) and Norman (Henry) Jenkins, of Woodville Road who seemed to have carte blanche regarding their conduct. Sitting in the back row, they would liven up the day with hilarious wisecracks and we lesser mortals would just snigger behind our books. Gibby was no fool. If you can’t beat ‘em, join ‘em. He made the two of them class monitors which meant that they could wander off, at will, purportedly on class business, at any time during the day. This they did frequently. Then came the great day! Towards the end of June, 1937, Headmaster Davies, disrupted the morning routine by making an entrance. He was clutching a fistful of papers, pince-nez was rigidly clamped to his nose and he walked with firm tread to the front of the class. We sensed what was coming. I’d made it! I’d made it! Sportingly, Ossie Sanguin, who sat behind me, patted me on the back. I was well and truly stunned and it was hard to realize that the obsessive fear of the dreaded Scholarship examination, had been laid to rest, at long last! Delight, too, came later for Jack Timothy and Alan Rosser who had secured the only two places available in the Swansea Junior Technical College- a far tougher examination. Later in the month, paper work arrived by post for parents to read and digest. Signatures were needed to confirm acceptance of the conditions for entry into the Grammar School system. This was a heavy burden for many families in the blighted ‘thirties, - a £12.0s.0d. annual school fee, compulsory official school uniform and sports gear, travel expenses (season ticket for the Mumbles Train), specialised extra curricular books etc. and cost of lunch time meals. Not appreciated in these days of profligacy, is the magnitude of such a burden when every family member in full time education was one less contributing to the family budget. They were passengers in an already overloaded train. July 1937, drew to a close. It was time for me to bid farewell to the Board School. . The odyssey from the earliest of days in the infants and through the big school was over. I had been well cared for. I had received a dental check up every six months. Once a year, the school doctor had weighed me, measured me, tapped me and listened to my heart and every term a kindly, grey haired nit nurse examined my scalp (and by the Grace of God left, frustrated). I had a third of a pint of fresh milk, every morning, in a bottle with a cardboard top, (specially designed so that when I pressed the middle of the cardboard cap to make access for my straw, the milk squirted out, all over the place). Mr. Rees the Boardman, in navy blue serge uniform, peaked cap with silver Borough Arms badge, would call at my home within 24 hours of an absence from school. Every Monday morning, first thing, I queued up at the form master’s desk to put my weekly savings in the school bank and have my card marked (literally). I had learned how to survive in the jungle of the school yard. I had been provided with an excellent basic education. I had been taught right from wrong. I had learned how to behave in a disciplined environment for the benefit of my fellow man. I had been taught a basic form of Christianity and, although young, I could see little to criticise in a doctrine based on love and from infant days I had been taught the true and full meaning of Christmas and Easter. And, what warm and lovely memories persist of the Advent of Christmas! The exciting weeks before, when we made our own Christmas cards and decorations for Mum and Dad, and that lovely Christmas tree that would appear in the school hall, bedecked with tinsel and glass balls, (so carefully stored away every year). Then, that wonderful last day, all packed in the Main Hall for the Christmas Concert. Dappy played the piano and we sang every Christmas Carol in the book! Before leaving for home and our Christmas holidays, there was one last job. Back to our classrooms to draw out our savings- meagre though they were! The last farewells- “Merry Christmas, Sir!” - and home. Now it was all over. By any standards, I had been blessed. The Last Day. End of July 1937. I walked up the ramp from the school yard to Newton Road, for the last time as a pupil. My heart was heavy, I was leaving a place where I had eventually found happiness and for the first time in my life, a degree of success. I was leaving teachers I liked and most distressful of all, parting from many, many life long friends. Again, “the black dog” of self doubt was across my shoulders. Would I measure up to the challenges that lie ahead in the new school? That’s another story. Now, whether I liked it or not, it was time to move on. Me, and the black dog on my shoulder.